Motorola's Razr I smartphone, which Motorola unveiled at an event in London last Tuesday, is the first handset ever to be powered by a 2GHz Intel Atom chip. The firm claims that using an Intel processor means the Razr I outperforms its dual-core ARM-based rivals, and is 40 percent more powerful than the iPhone 4S. Let's take a look at the phone..
Crafted from diamond cut aircraft-grade aluminium with the now-familiar Kevlar back, the Motorola RAZR i is an absolute pleasure to hold.The Razr I visually looks like a cross between a shrunken version of its original Razr smartphone and its "lifeproof" Defy series.The handset has the same black round edges and corners and patterned back seen on older Razr models. Despite feeling like it's made of plastic, the Razr I features the same lifeproof kevlar coating as its predecessors. This means that as well as being scratch and drop proof, the Razr I is also splash proof, so it would save us the occasional spillage incident. The Razr I possesses a 4.3 inch edge-to-edge display that boasts a 540x960 HD resolution based on Super Amoled technology. The Razr I is the first phone to hit the UK powered by a 2GHz Intel Atom chip. 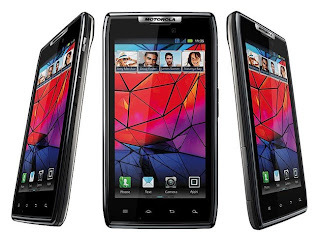 The Razr I will run on the Android 4.0 Ice Cream Sandwich OS. Motorola has also loaded the Razr I with its own custom user interface (UI). The 8MP camera starts up in under a second and shoots 10 photos in, again, under a second. There's a dedicated shutter key, to make the whole experience quicker and more comfortable. Intel's technology also enhances the image quality. The Motorola RAZRi packs NFC connectivity for easy sharing of data and pairing with Bluetooth headsets. Running on the Android 4.0 Ice Cream Sandwich OS, The RAZRi will come with an unlocked bootloader. The Razr I is set to be released in early October through Orange, T-Mobile, Tesco Mobile, Virgin Media and Phones 4u and will cost around £350. 0 Respones to "Motorola RAZR i hands-on"